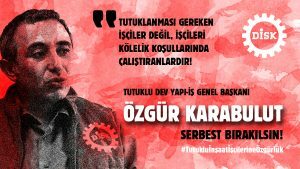 Mr. Ozgur Karabulut, President of DİSK/Dev Yapı-İş (Progressive Union of Construction Workers) was detained by Gendarmerie. He is one of the spokespersons of airport workers. DEFENDING DECENT WORK AND DECENT LIVING CONDITIONS FOR CONSTRUCTION WORKERS IS NOT A CRIME! 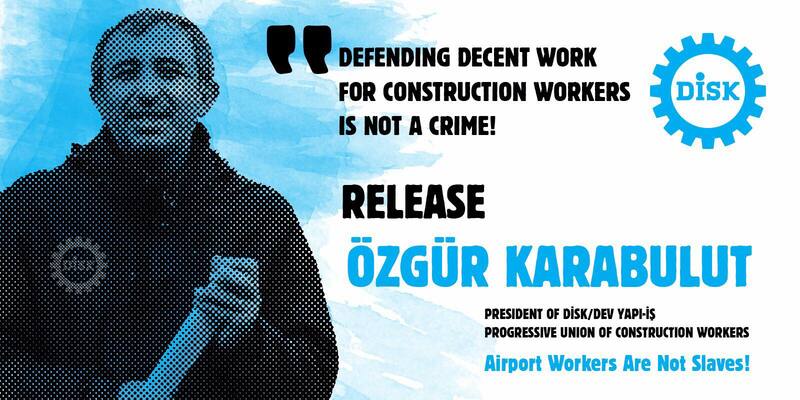 Özgür Karabulut, President of Progressive Union of Construction Workers, must be released immediately! 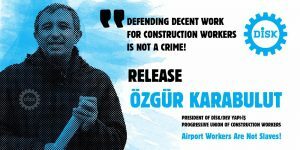 The pressure and violence against the workers who are protesting slave labour and inhumane living conditions in the Istanbul New Airport construction site is getting deeper while the number of imprisoned workers has risen to 34 with the arrest of DİSK Dev Yapı-İş President Özgür Karabulut. 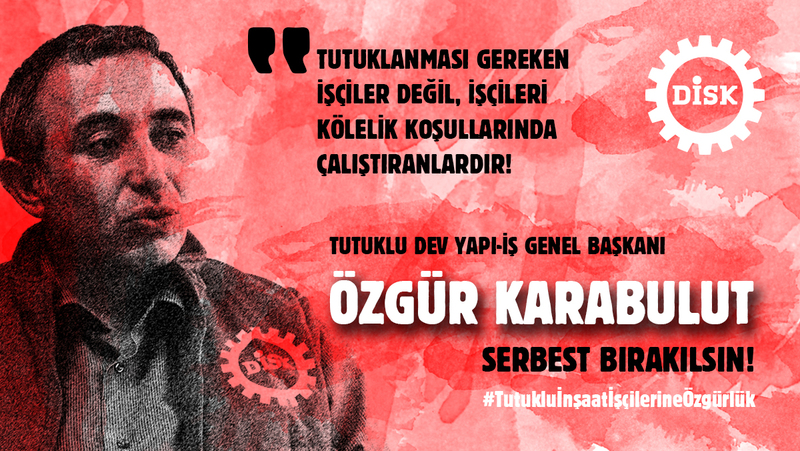 Ozgur Karabulut, conducted the rightful struggle of the Airport workers who were killed in occupational murders, whose salaries were not paid properly and their bodies were fed to bedbugs. He carried out his trade union duties that are given to him by the construction workers and their union. This detention is aimed at criminalization of his trade union activism. Defending decent work for construction workers is not a crime but a duty for a unionist. The crime is to prevent them from fulfilling their duties. The real criminals are those who shut their eyes to occupational murders, unpaid salaries, and bedbugs. The real criminals are those who shut their ears to the demands of the workers. Each of these demands is a criminal complaint. They’re the bosses who are supposed to be arrested not workers. The main culprits are the public authorities which allow slavery-like- conditions, namely the Ministry of Labour. Those who tried to suppress the demands of the workers at first with gas bombs, water cannons; now, with detentions, arrests, lies; is acting at the expense of all workers in the country. It is not the workers who demand decent working conditions to be arrested, but the bosses who employ workers under slavery conditions! All construction workers must be released immediately, all their demands must be fulfilled and an effective investigation must be carried out on the employers. It is not a crime to defend the rights to decent work and life for construction workers! The total number of prisoners is 35 by now. 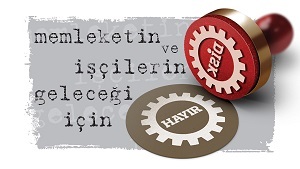 During the construction of Istanbul Grand Airport, 37 workers were killed after occupational accidents and many more injured.